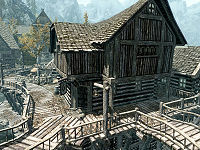 The Bee and Barb is an inn located in the center of city of Riften, next to the marketplace. Keerava and Talen-Jei, an Argonian bartender, work here. Marcurio is a mercenary for hire that can usually be found sat in the southwest corner on a wooden bench. There is only one interior zone in the location. * If he is not following you or made steward of any of the houses you build HF. Aerin — An Imperial who arrives at the inn around noon to sit and have dinner with Mjoll, leaving with her six hours later. Indaryn — A Dunmer who helps run the Black-Briar Meadery who visits the inn every day. Louis Letrush — A Breton frequenting the inn before finishing the quest Promises to Keep. Marcurio — A sellsword who sits on a bench by the southern entrance. Maven Black-Briar — The matriarch of the Black-Briar family who will occasionally be found sitting next to a table upstairs in an alcove near the staircase. Mjoll the Lioness — The "champion of the hold" who arrives at the inn at around noon to sit and have dinner with Aerin; she and Aerin will leave The Bee and Barb around 6pm. Romlyn Dreth — A Dunmer employee of the Black-Briar Meadery who comes to the inn after finishing his shift and usually sits by the bar attempting to sell the player his cheap Black-Briar mead. Sapphire — A member of the Thieves Guild who leans against a wall near the staircase. Vulwulf Snow-Shod — A loyal Stormcloak supporter who arrives at the inn at noon to sit and have several drinks before leaving at 6pm. Sealing the Deal: Find three flawless amethysts for Talen-Jei's engagement ring. The Bee and Barb has two entrances, one positioned next to Marise Aravel's cart near the marketplace and the other north of this door. The Bee and Barb looks out of shape as the upstairs area is bigger than the common room, and thus it has wooden supports holding the first floor up. The front of The Bee and Barb can be architecturally viewed from the entrance to Haelga's Bunkhouse. Talen-Jei will normally be found working on the ground floor, sometimes sweeping. The common room consists of three tables, each with chairs, where the visitors of the tavern will sit to drink and eat. These hold three salmon steaks, a couple of wedges of cheese, a few loaves of bread, a bottle of wine, a boiled creme treat, a potato, a cabbage, a sweet roll and a baked potato. Keerava will be found behind the L-shaped counter, which is by a fireplace in a small corner of the tavern to the west. On the counter are two bottles of alto wine, a bottle of Nord mead, two boiled creme treats, an apple pie and several pieces of cheese, with a small and a medium coin purse found underneath. On the mantelpiece over the fireplace is a bottle of Nord mead. Two stools are next to the counter. Sapphire, a member of the Thieves Guild, will be found leaning against a wall in the tavern area until you complete a quest for Shadr. There is a set of shelves holding clutter, two dressers with a bottle of alto wine, and a wooden bowl containing a red, blue and purple mountain flower on one of them. There is a doorway to a storage area in the northwest corner of the common room. In this room are several food barrels, a cooking pot on a stand and, against the east wall, a long wooden table holding a salt pile, a sliced goat cheese, a couple of loaves of bread, a cabbage, a rabbit and a couple of sacks of foodstuffs. Above the table is a wall shelf holding a couple of goat cheese wheels, and hanging from the ceiling above is a garlic braid, two bunches of elves ear and a bunch of frost mirriam. There is a door in the middle of the east wall that leads to a flight of stairs down to the cellar, with several barrels of food around the top of the stairs. At the bottom, the cellar is one big storage area with a pile of firewood and woodcutter's axe under the stairs, several food and mead barrels and sacks around the cellar along with a couple of baskets, one containing potatoes and the other a mixture of red and green apples. Hanging from the ceiling are three garlic braids, two bunches of elves ear, a bunch of frost mirriam and a couple of racks holding three pheasants and another rabbit. Against the west wall are a couple of large vats and a set of shelves holding two bottles of alto wine, two bottles of wine and four bottles of Nord mead. To the south, against the wall, are two sets of shelves and a cupboard that only holds clutter. On the shelves are several pieces of cheese, a gourd, a bunch of elves ear, some more potatoes, two cabbages and a couple of loaves of bread, with a bowl of bone meal on top of one of the sets of shelves. Above the staircase leading down to the cellar is a flight of wooden stairs leading up to the second floor. There are a couple of food barrels by the top of the stairs as well as a door through onto a large landing with a door to the south, one to the west, a third in the north west corner and finally a fourth that is apprentice locked to the north. To the right of this last door is a long wooden table with several pieces of cheese, a loaf of bread and a bottle of wine on top with two chairs beside it. This is where you will first be introduced to Maven Black-Briar during the Thieves Guild quest line. Talen-Jei's bedroom is to the south and consists of a single owned bed in the southwest corner with a chair beside it and against the south wall a dresser with a copy of A Dream of Sovngarde and a note on top. The note is a reply from Drifa regarding the Priests of Mara being able to perform the traditional Argonian wedding ceremony for him and Keerava. The bedroom to the west, which is the room you can rent from Keerava, consists of a single owned bed against the north wall with a chair beside the bed and an empty unlocked chest against the west wall. The third bedroom consists of a single owned bed against the west wall, with a dresser with copies of Nightingales: Fact or Fiction? and Of Crossed Daggers on top. The door with the apprentice lock is Keerava's bedroom and consists of a single owned bed in the northeastern corner, with an end table beside it holding a bottle of alto wine. At the foot of the bed is an unlocked chest containing nothing. To the left of the chest, further along the north wall, is a small square wooden table and chair. This table holds the business ledger, a bottle of wine and an apprentice locked strongbox containing random items. Against the west wall is a tall wardrobe containing clothes. There is a Loot shadowmark to the right of the entrance door. In Keerava's room there is a chest. Three unique drinks are available for purchase, all named for various famous things—the Cliff Racer named for the extinct bird, the Velvet LeChance named for a notorious assassin, and the White-Gold Tower named for the tower in the Imperial City. These are found under potions when carried. All containers in the area, with the exception of some barrels and sacks, are non-respawning and safe to store items in.